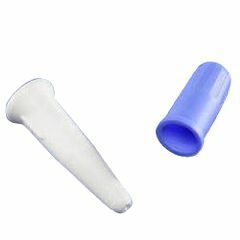 Catheter Plug is made of high quality plastic, with thumb grip. Latex-free. Not sure about an active life..
Temp stoppage of catheter. Disabled. Allows me to temporarily to block fluids from going in or out of the catheter. Allows me to swim freely. I can go without a catheter bag for short periods of time until my bladder gets full. My Dr. uses same plugs. My Dr. uses same plugs. Following Surgery. Emergency. Elderly. Anyone with a catheter. These plugs are the same as used by my Dr. I just put the plug into the end of my catheter before taking a shower, and it protects from any UTIs. Works very well as a stopper, leaves plenty of room to hold it without dropping it. Very pleased with this product. I sometimes have to fetch an item or two at which time this catheter plug allows me to temporarily disconnect from my drainage bag tube and plugging the catheter allows me to do that. When I return I simply switch back to the drainage bag so I can lay down and rest again. It works ok. My Urologist says to take it out every two hours. I preface with, "Always follow physician instructions." Urine retention time and microbial contamination (bacteria, fungi, etc.) are the issues. Microbes are everywhere, even in air. The more often and how the plug is handled, the greater the microbial contamination. A gentle twist off/on as needed to urinate is optimal as needed and every several hours should be sufficient. Urine can grow microbes so emptying the bladder removes them before infectious levels can occur. Plug removal several times per hour greatly increases likelihood of contamination. Try to remove/install the plug by gripping it at the flat end between the your fingers, trying not to touch the tapered plug end and stand it up on its flat end on a piece of toilet paper on a dry surface, if possible. See if you can do in all in one motion. Put on nitrile exam gloves and wash them with warm soap and water and paper towel dry before plug removal, especially if you've touched any surface or skin after putting them on and then drain the bladder. Note: Cranberry extract has been proven to interfere with bacterial attachment to the bladder wall, hence, more easily flushed out with urine reducing infections. Ask your physician about it. Any instrument/appliance added to the body externally increases infection risk, so infections will always be a concern. Hope this helps.